Newly updated DVD of this long-unavailable classic now on sale! When Billy Broke His Head ...and Other Tales of Wonder is an entertaining, irreverent road movie about disability, civil rights, and the search for intelligent life after brain damage. Following a traffic-accident, award-winning radio documentarian Billy Golfus woke from a coma to find himself head-injured, hemiplegic and dependent on others. When Billy Broke His Head... tells of Golfus’ struggle to make a new life for himself in the face of pervasive discrimination and bureaucratic “helping systems.” Accompanied by filmmaker David E. Simpson, Golfus travels the country encountering disabled people of all stripes, and witnessing the strength and anger that has forged a civil rights movement for disabled Americans. 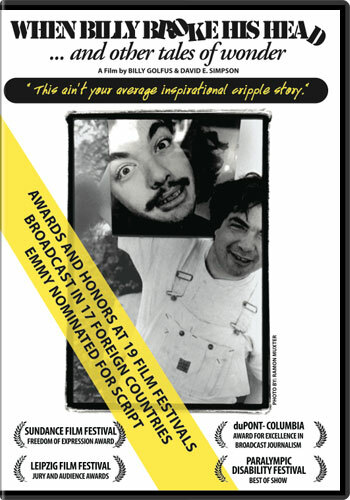 Laced with humor and biting wit, When Billy Broke His Head... is a widely acclaimed, groundbreaking film about disability culture; a no holds barred, first-person account that refuses to tell the “inspirational” stories we have come to expect from films about people with disabilities. When Billy Broke His Head... And other Tales of Wonder was funded by the Independent Television Service (ITVS) with funds provided by the Corporation for Public Broadcasting. When Billy Broke His Head - Trailer from Kartemquin Films on Vimeo. Audio Description and Closed Captioning.